Vancouver – With just over two weeks to go until Vancouver’s Curious Imaginings immersive sculpture exhibition closes, 12 Days of Curious launches December 3 as a festive good-bye celebration of artist Patricia Piccinini’s amazing sculptures. Vancouverites are invited to return for a last visit or to finally come see why many visitors proclaim this Vancouver Biennale exhibition “Vancouver’s most transformational art experience of the year”. Already, over 7,500 visitors have experienced the Patricia Hotel located exhibition which has also received more than 2000 social media posts, 250,000 likes and extensive press coverage. The hyperrealist “world of oddly captivating, somewhat grotesque, human-animal hybrid creatures” is the artist’s first exhibition in a non-museum setting. In the intimate Patricia Hotel setting located in a neighborhood continually undergoing change, Curious Imaginings empowers visitors to personally consider questions posed by the exhibition including the promises and consequences of genetic research and human interference. 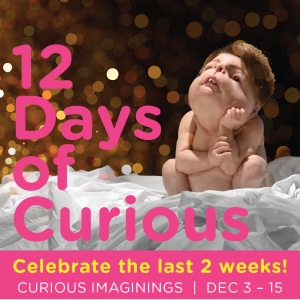 12 Days of Curious runs Monday, December 3 to Friday, December 14. Attendees each Curious Day can enter to win a daily Curious Day prize of two Curious Imaginings T-shirts and a Vancouver Biennale catalogue ($60 value). As a thank-you, all attendees since Curious Imaginings’ opening in mid-September can also enter to win the spectacular 12 Days of Curious Grand Prize: A limited edition Vancouver Biennale unframed double-sided OSGEMEOS GIANTS print in Vancouver ($250 value), a Curious Day prize and a $200 gift certificate to celebrated Bauhaus Restaurant (total value over $500!). Find details about 12 Days of Curious and enter to win the 12 Days of Curious Grand Prizeat www.imcurious.ca. Tickets are available at the door or online at $19 for adults, $15 for students and seniors, and $40 for a family of four. Open daily 11-7 (last entry at 6:15). Gastown’s Bauhaus Restaurant was inspired by the early 20th-century Bauhaus design movement which was famous for its unique approach to architecture and design where every form has a function. Using these principles for each dish on the menu, the chefs at Bauhaus source only the best quality ingredients, staying true to their form and matching them with flavors that all have a function on the plate.Bauhaus Restaurant offers three crafted menus: Chef Tasting Menu, A La Carte and the German Classic Menu. Bauhaus has had the honor of being highly-acclaimed internationally. Recently, The World’s 50 Best Restaurants’ Diner’s Discovery Series selected Bauhaus as a “Restaurant to Watch”. The list is considered the ‘next generation of dining destinations.’ This past year Bauhaus was also listed as one of “Best German Bars and Restaurants Around the World” by CNN, and as part of the new global face of German cuisine by Wine Enthusiast. Visit bauhaus-restaurant.com for more information. The Vancouver Biennale celebrates art in public space. Each exhibition transforms the urban landscape into an Open-Air Museum, creating globally inspired cultural experiences where people live, work, play, and transit, while becoming a catalyst for community engagement, learning, and social action. Visit www.vancouverbiennale.com for more information. For media inquiries, call 604-682-1289 or email media@vancouverbiennale.com.